When uttered in the presence of any fantasy player the controversial word immediately conjures dread, disgust and an overwhelming feeling of blah. Coarseness toward it is understandable. Due to the increased presence of rotational backfields in recent years, gamers loathe platoons. They not only diminish player values, but frustrate those needing to make critical lineup decisions on Sunday mornings. However, because of the remarkable depth at quarterback this year, "committee" shouldn't cause fanatics to wretch. When applied appropriately, it's an approach that could pay huge dividends for those that relish less-competitive formats (12-teams and shallower), particularly those with fairly sizable benches. As a whole, the QB position is loaded with value. Once the elite tier comes off the board (Brees to Peyton), anyone from RGIII to Michael Vick to Carson Palmer is capable of holding their own. 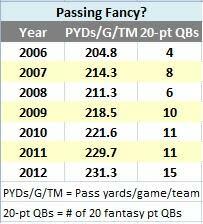 Triggered by the explosion of pass-heavy offenses in recent years (see right), the market has become supersaturated. The result: 20-plus point performances, once tallied by only a handful of players on a routine basis, have become extremely common. For example last year Josh Freeman, who checked in at No. 15 among QBs netting 20.3 fantasy points per game, would've ranked No. 2 at the position in 2005. Stunning. With that in mind, an increasing number of drafters are employing a unique strategy almost unthinkable a few years ago. QBBC is now en vogue. Because most leagues only require one starting QB, the likely drop-off from projected top dog Drew Brees to projected No. 12 Tony Romo likely won't be overly dramatic. Recall last year, the Saints slinger, the top-ranked passer in Fantasyland, outdistanced QB12 Russell Wilson by 6.5 points per game, a disparity nearly identical to the separation from Calvin Johnson (No. 1) to T.Y. Hilton (No. 36) among wide receivers. Obviously, the strategy isn't applicable to two-QB or very challenging formats, but if executed properly in more traditional settings, owners can reap major benefits from spinning around the revolving door. Streaming (choosing a starter based on matchup) a rotation of Ben Roethlisberger, Sam Bradford and Alex Smith, could not only prove effective, it would allow owners to focus on loading up at RB and WR on draft day. Due to the relentless injury imp, depth at those positions is absolutely vital. Not only does it provide a crutch, it can also transform you into the Vito Corleone of trading. Once believed to be fantasy suicide, QBBC is breathing new life into drafting. As detailed above, most pundits feel QB is a bottomless pit of value. Hypothetical dilemma, if Drew Brees or Aaron Rodgers hung around in a standard (4-point/pass TD) 12-team draft, at what point would you seriously consider taking the plunge: ROUND 2, ROUND 3 or LATER? Dalton – LATER. If I'm in a league in which Aaron Rodgers falls to round 3, that means the participants are going to devalue the position in a big way (like our recent Friends & Family draft), which results in even bigger QB bargains later on. But to be clear, taking Rodgers or Brees in the third round is not a BAD pick. Brad – ROUND 2. This is clearly a statement about how valuable high-floor is compared to chasing high-ceiling. Brees and Rodgers are consistency kings at their position regardless of scoring system. Each has finished inside the top-five every year since 2008. Andy – We all recognize that QB is a deep position, but it's not deep with players who can reasonably be expected to throw for 4800 yards and 40 TDs. Brees and Rodgers (and perhaps Peyton) are the only guys who should be projected to reach that level of production. They each have long histories of elite production. Thus, I'd go ROUND 2. 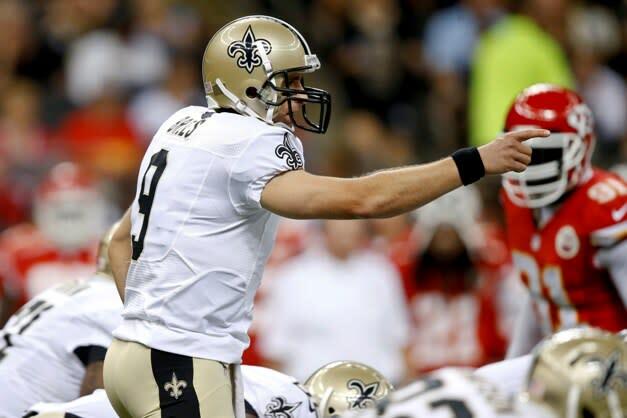 Remember, only five quarterbacks threw 30 or more TD passes last season; Brees threw 43. BELIEVE or MAKE BELIEVE. Michael Vick impossibly plays 10-plus games, resembles the vintage passer seen against New England in Week 1 of the preseason and finishes inside the top-12 in per game average. Brad – BELIEVE. Outwardly, Chip Kelly has continuously squawked about an open competition between Vick/Foles. Internally, however, No. 7 has already ran away with the job. If Vick is protected adequately, he still possesses enough nuclear characteristics to not only finish top-12, but top-five. Given his history, he's a bit of a dice roll, but it's not like you have to stake much to acquire his services (111.4 ADP, QB15). Andy – Sure, I'll BELIEVE. If we make this per-game average, it's kind of a layup. Vick's line, if it stays healthy, should be plenty respectable this year, and we all love his rushing potential in Kelly's offense. As long as D-Jax stays healthy, he'll at least have one uncoverable receiver at his disposal. Brandon – BELIEVE. In terms of per game average, he in the top 10 at QB in '10 (No. 1) and '11. And last season, before the game in which he was concussed, he was sitting at No. 9 in fantasy PPG at QB. So, top 12 is definitely doable. Now, 16 games probably isn't, but I'll buy that he plays more than 10. Robert Griffin III, Russell Wilson, Andrew Luck and though 2013 marks his third-year in the league, Colin Kaepernick, enter Year No. 2 as starters. Which signal caller has the strongest odds of experiencing a sophomore slump (Finish outside the QB top-12)? Andy – As much as I love his game, it has to be RG3. He's coming off his second ACL surgery, his receivers aren't exactly the league's finest, and I really doubt his rushing workload will look like 2012. Brandon – RG3. He's not likely going to produce at the level he did as a rookie simply because he won't be able to sustain the immense rushing value he brought to the table. Mike Shanahan will have him dial back on that, especially those red-zone runs where he would simply shoot himself towards the end zone like he was shot out of a cannon. Scott – ROBERT GRIFFIN is the only answer to this question. How healthy is he? How much will they utilize his running skills? How effective will the pass game be if Griffin isn't a read-option threat all season? I love the player and his work ethic, but he's the biggest question mark at this position. Tom Brady’s offseason was a bit deflating after the QB lost nearly 70-percent of his receiving offense from a season ago. OVER/UNDER Touchdowns thrown by Tom Terrific this fall 31.5. Brandon – UNDER. Let's remember that Brady has been under this number seven times in his career as a starter (not including his injury-ruined '08 campaign). With the issues/exits in the passing game, I think Brady finishes a TD toss or two short of this number. Scott – UNDER, though it's a fair number. The Patriots have an offense that's capable of scoring any way you want - very underrated stable of running backs - and I don't see any way red-zone weapon Rob Gronkowski plays a full season. Someone will pick up some of the slack, but this is Brady's weakest receiver group since 2006. Dalton – OVER. Brady has averaged 36.3 touchdown passes over the past three seasons, and this includes last year when the Patriots attempted the second most rushing attempts in the NFL. Brady is still the No. 5 QB on my board despite New England's perceived losses, but there's also the chance Danny Amdendola and Rob Gonkowski play in more games than expected, and Shane Vereen is primed to make a leap as well. But most importantly, QBs make WRs far more than vice versa. 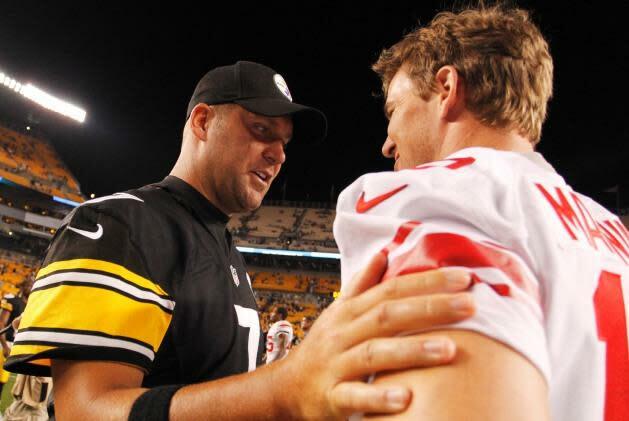 Ignoring Vick, what overlooked QB is the virtual game’s most undervalued? Scott – I'm dreaming of the numbers ALEX SMITH might assemble in the Kansas City offense - specifically, the Andy Reid offense. Okay, this is QB2 territory, but still, there's a cheap price tag here and plenty of upside. Dalton – There's a clear cut top-12 this year, but when it comes to QB2s with the best potential to end up inside that dozen (other than Vick), I'd argue it's clearly Eli Manning and Ben Roethlisberger, who are huge bargains right now. Brad – RUSSELL WILSON. Since losing Percy Harvin to hip surgery, the sophomore QB's ADP (86.4) has unsurprisingly plummeted. Once slightly overvalued he's now undervalued. Remember without Harvin on roster a season ago he ranked No. 1 among passers in per game average over the final eight weeks of the fantasy season. Cunning, accurate, opportunistic on the ground and blessed with a stellar offensive line, he'll likely pick up where he left off. Conversely, what gunslinger is the most overvalued? Dalton – I'm a bit concerned with ANDREW LUCK, but mostly, my answer here is whichever quarterback among the 5-12 ranks in your league gets taken earliest. Also, it appears my two most undervalued QBs (Big Ben and Eli) are my colleagues most overvalued. Interesting. Brad – ELI MANNING. At this point, Eli's mad rhyming skills are more valuable than his fantasy self. Woefully inconsistent last year – he posted five sub 14-fantasy point games – he's an average commodity selling for a premium price. Vick, Ben Roethlisberger and Carson Palmer are far more attractive options going some 10-40 picks later. Andy – BIG BEN. Do you see a reliable red-zone target here? Because I really do not. There's no Mike Wallace in Pittsburgh this season, and don't expect to see Heath Miller anytime soon. Andy – Radiant! Dial it down, Evans. Manuel was facing a lousy defense, in a preseason game. He might prove useful this season as a bye-week placeholder, but this isn't Wilson or Griffin or Luck we're talking about. Put me down for 15 games, 3100 passing yards, 18 TDs, 14 INTs, 390 rushing yards, 4 rush TDs. Play the Powerball. What late-round lottery ticket (130-plus ADP) could have deep-leaguers rolling in greenbacks come year’s end? Andy – Man, I really wish you would have made this 120-plus, because there are some fun names in that group (Schaub, Freeman, Dalton). But if we're sticking to 130-plus, then I've gotta go SAM BRADFORD. His O-line was upgraded substantially, plus I really like his young receiving corps, led by Austin, Givens and Cook. St. Louis could field a fun, productive offense this season, setting up Bradford for his first 4000-yard season. Brandon – ALEX SMITH. He's only being drafted in 11 percent of Yahoo! leagues, but I think he has a chance to be a top 15 QB under the guidance of Andy Reid, who has produced top 10 fantasy QB numbers in 11 of his 14 seasons as an NFL head coach. Scott – I mentioned Alex Smith earlier, who would be my pick here. But just to throw out a different name, sign me up for all the SAM BRADFORD propaganda. The passing toys have been upgraded, and I don't know anyone who trusts their backfield. Dalton – CARSON PALMER. He threw for more than 4,000 yards last season, and while that's admittedly not as impressive of a feat in today's NFL, he did so in essentially just 14 games and playing for arguably the most dysfunctional franchise in football. Palmer will be playing in an extremely tough division with a shaky offensive line this year, but he'll also have Bruce Arians (and his downfield weekly attack game plan) as his coach along with Larry Fitzgerald, Michael Floyd and Andre Roberts as targets. He's set up for success. Brad – CARSON PALMER. The 33-year-old may appear a little stiff, but he still showcases an above average arm and cool demeanor in the pocket. If gifted proper protection, he will undoubtedly spot a massive pitch count. Bruce Arians attacks defenses through the air relentlessly. That combined with the fantastic weapons around him (Larry Fitzgerald, Michael Floyd, Andre Roberts and Rob Housler) and 4,200 yards with 30 TDs is entirely possible. Recall on an awful Raiders team last year he exceeded 4,000 yards with 22 TDs.